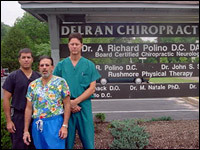 We're conveniently located close to Rt 295, New Jersey Turnpike, and Rt 130. Bear right onto ramp , at traffic light make a right onto bridgeboro road, 1 mile on the right. From Rt 295 NORTH - Proceed south to exit Delran / Rancocas Woods , Exit Delran, Make a right onto Creek Road ,proceed to 2nd traffic light, make a left onto Bridgeboro rd, the office is 1/2 mile on the right. From Rt 295 SOUTH - Proceed north to exit Delran / Rancocas Woods , Exit Delran, Make a right onto Creek Road ,proceed to 2nd traffic light, make a left onto Bridgeboro rd, the office is 1/2 mile on the right. From Philadelphia Airport - 95 north to Betsy Ross bridge to Rt 130 north. From Route 130 South- Proceed North to Bridgeboro rd (across from Home depot) Bear right onto ramp, at traffic light make a right onto bridgeboro road, 1 mile on the right. If you're coming from another location and you are not familiar with the streets on the map below, please contact our office for directions at (856) 461-6262. Click here to print page.